Google's Chrome browser is evolving into a very powerful platform. Not only can it be used to view your favorite website or mirror tabs to your Chromecast, but now that it has an App Engine, more powerful tools can be run within Chrome. 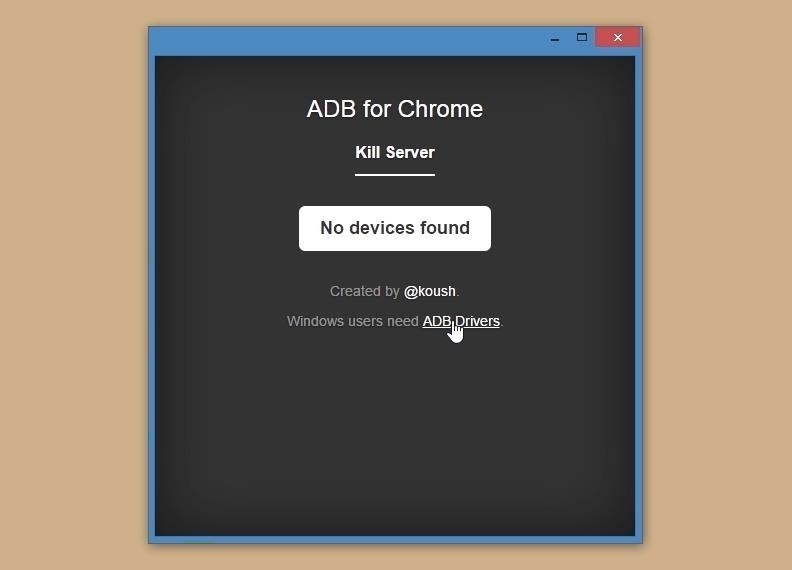 Android developer Koushik Dutta has just released such a tool, which allows you to easily send ADB commands to your phone or tablet from within the friendly confines of your favorite web browser. 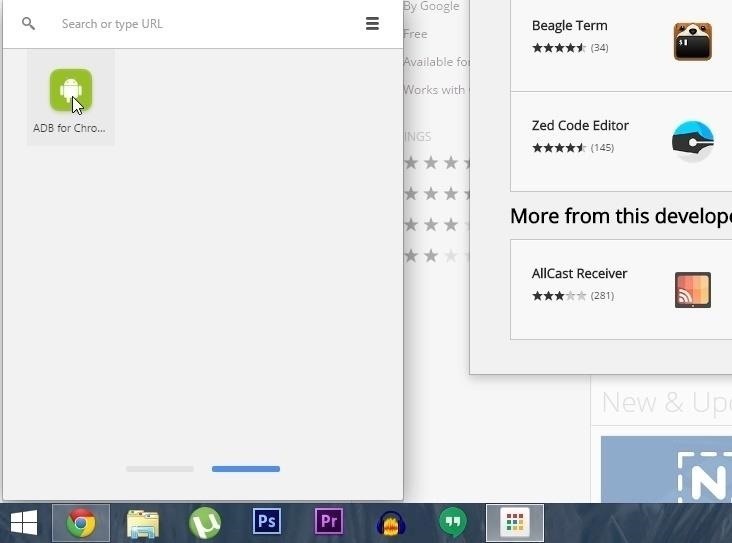 This new Chrome app is lightweight and easy to install, so it's certainly worth a look. To get the app installed, head to the Chrome Web Store and search ADB for Chrome. Alternatively, you can use this link if you'd rather jump straight to the install page. From here, click "Add to Chrome," then click "Add" on the subsequent popup. At this point, the app will be downloaded and installed automatically. And with it being an app rather than an extension, you'll see the Chrome App Launcher pop up when it's done installing, so use this menu to launch the app. From here, make sure that "USB debugging" is enabled in your phone or tablet's "Developer options" menu. If you don't see this menu in Settings, head to "About phone," then tap the "Build number" entry 7 times to activate it. Next, simply connect your Android device to your computer with a USB data cable. If your device is not immediately recognized, this is likely because you don't have the ADB drivers installed. To take care of that issue, Windows users can simply click the "ADB Drivers" link at the bottom of the app. Mac and Linux users will not need to worry about drivers. With the app connected now, you'll see three options. The latter two allow you to capture screenshots and record your device's screen, and clicking one of these options will prompt you to choose a save location on your computer. The first option is the most powerful—click this icon to launch an ADB shell window. From here, you can execute ADB commands just as you would with the full version of ADB. 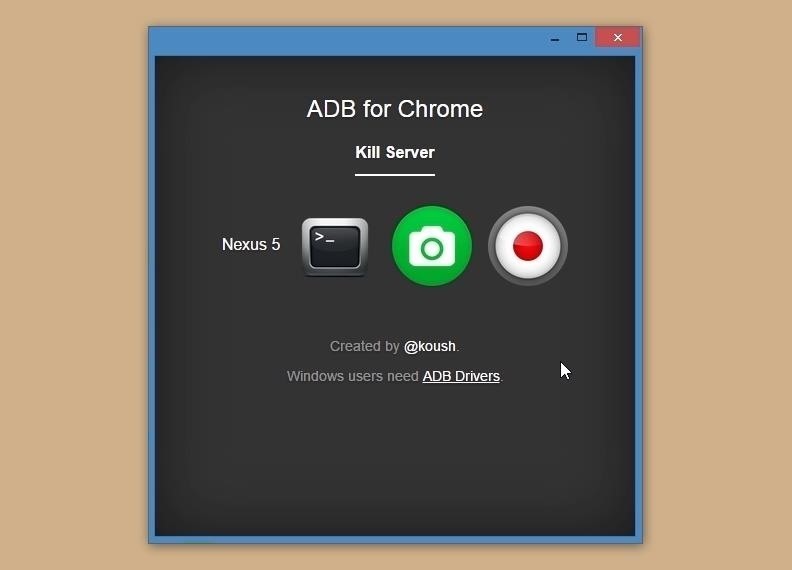 Does the ease of installation for this Chrome app make you more likely to use ADB commands? Let us know in the comment section below, or drop us a line on Android Hacks' Facebook or Twitter, or Gadget Hacks' Facebook, Google+, or Twitter. The ADB Drivers button is not working (that would let me download the required drivers). Can you please share a link for the required drivers? The ADB Driver button not working..